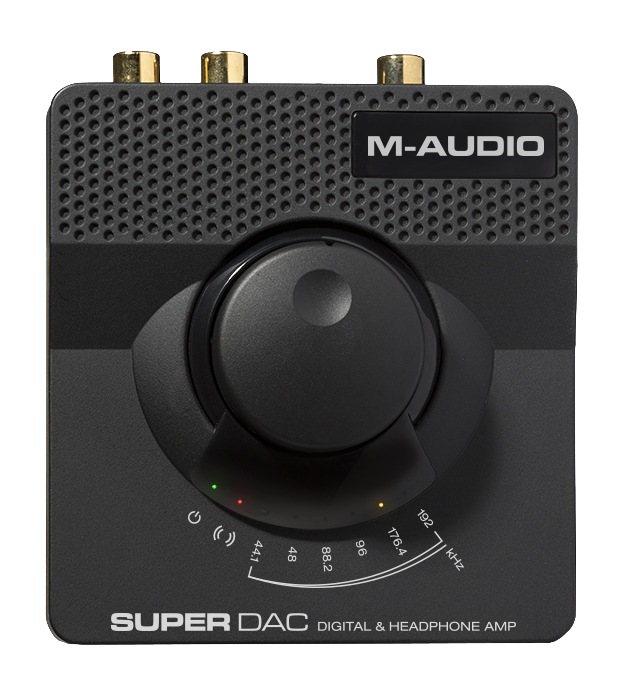 The M-Audio Super DAC is a compact digital-to-analog converter featuring Wolfson DAC/ADC converters. The Super DAC also features RCA analog outputs and digital coaxial and optical outputs, as well as both 1/8" and 1/4" headphone outputs. This guide discusses some common questions about it's features and functionality. Why would I need a DAC? Does the Super DAC require any drivers? What sample rates does the Super DAC support? What type of digital outputs does the Super DAC use? Does the Super DAC support surround formats? Is the Super DAC supported for use in iOS? What is the stereo input for? Why are the headphone outputs different volumes? What do the different color LEDs indicate on the Super DAC? A DAC, or Digital Audio Converter, is necessary to get an audio or music signal from a digital state, like a .WAV file on your computer, to an analog state, an electrical signal that can be played back with your headphones or speakers. Any music that exists on your computer, phone, tablet, or other device is already digital and will use some sort of a digital converter before it makes it to your ears. Any digital device with speakers or a headphone output will already have it's own form of DAC, but these often only cover the bare-minimum and can leave a lot to be desired. In comparison, music playback may sound dull and less defined. Using an external DAC, like the Super DAC, is an easy way to upgrade the quality of audio playback from your device by providing superior conversion processing and higher sample rates. The Super DAC features Audiophile-grade Wolfson conversion and sample rates up to 192 kHz, allowing you to get more precision and details out of your music and audio playback. The Super DAC has two digital outputs: S/PDIF Optical and Coaxial. These can be used to easily send a digital output from your computer via USB to a S/PDIF optical or coaxial input on a home stereo system or an audio interface. These connections can often be mistaken for other formats that use similar cables/connection types such as ADAT ports on an audio interface or an analog RCA port on a home stereo system. Be sure to check with the your devices documentation to find out if it supports S/PDIF optical or coaxial. The Super DAC will only playback stereo files, but can pass-through Dolby 5.1 or DTS surround formats to be decoded and played back on your home stereo system. Is the Super DAC supported for use on iOS? Because the Super DAC is class compliant for mac, it will be supported for use on iOS but only with a power supply (sold separately) and an Apple certified Camera Connection Kit. The device may not receive enough power from the iPad/iphone alone, so the power supply ensures it will receive the proper amount of power. The stereo input is included to allow you to connect a phone, tablet or other device to any speakers connected to the analog outputs. This way you can quickly switch between your sources without disconnecting anything. The switch labeled Analog/Digital on the front will switch between the USB/computer input (Digital) or the stereo input on the front (Analog). This input will not be sent over the USB cable to be recorded onto your computer or iOS device. The two headphone outputs on the front are designed with different impedance values to adapt more easily to the variety of headphone types available today. The smaller 1/8" (3.5mm) output is low impedance output that is suited better for consumer grade headphones (ipod headphones), while the larger 1/4" output is high impedance and better suited for high impedance headphones, typically studio or professional grade. If you are unsure which one you should use, check the documentation for your headphones. Impedance values would be measured in Ohms (Ω). Low impedance is typically less than 50Ω, and high impedance is more than 50Ω. When referring to headphones, impedance is essentially the amount of resistance being applied by the device to the flow of the audio signal. For the best results, you'll want the impedance of the output device to match the impedance of your headphones. This ensures that the signal has enough pressure to be pushed through the system properly. For example, think of a garden hose. The nozzle on the end will represent your headphones. When you close the nozzle, this adds impedance (like high impedance headphones) and creates pressure in the hose. Less water (signal) is able to get through. The more you reduce the impedance, the more you reduce the pressure in the system. Based on this scenario, if you were to attach your high impedance headphones to a low impedance output, the impedance level may be so high that the signal in the headphones is too low and you are unable to turn the volume high enough. Adversely, low impedance headphones in a high impedance output may not provide enough resistance, resulting in a very high output and potentially damaging the headphones from the amount of pressure. For a more detailed description of impedance, check out the article here. The Analog Output LED will illuminate with different colors depending on what audio channels are being output. This LED illuminates red, blue, and purple depending on the output signal. The LED will illuminate blue for the left channel, red for the right channel, and purple when both channels are outputting audio simultaneously.